The Walking Dead: Blackberry, Yahoo and the Zombie Apocalypse! You may be wondering why I am talking about television shows on a blog dedicated to markets, but the Walking Dead was what came to my mind in the last couple of weeks, as I watched Blackberry and Yahoo, two companies that I have posted about before, make the news. Blackberry announced that they were introducing a new phone, priced at $599, and aimed at getting them back into the smartphone market. Yahoo was initially not in the news, but Alibaba, a company that Yahoo owns 22.1% of, was definitely the center of attention at its initial public offering on September 19. While Alibaba opened to rapturous response, its stock price jumping 38% on the offering date, Yahoo’s stock price strangely dropped by 5%, the day after. By the end of last week, Yahoo had been targeted by an activist investor, taken to task for not managing its Alibaba tax liability and pushed to merge with AOL. Since I have owned Yahoo for the last few months, I have a personal financial interest in trying to make sense of the dissonant behavior and I am afraid that the Walking Dead is the best I can come up with as an explanation. A few months ago, I posted on the life cycle that businesses go through and argued that companies are born, grow, mature and decline and that it is often both expensive and pointless to fight the cycle. The life cycle view of the corporate world may be simplistic, but it is surprisingly powerful in analyzing the evolution of corporate governance and different investment philosophies. Thus, there are some who argue that while an autocratic CEO can be a hindrance in a mature or declining company, he or she can be an asset early in the life cycle, and that success goes to those who are strong on narrative, early in the life cycle, but that the numbers people dominate later. 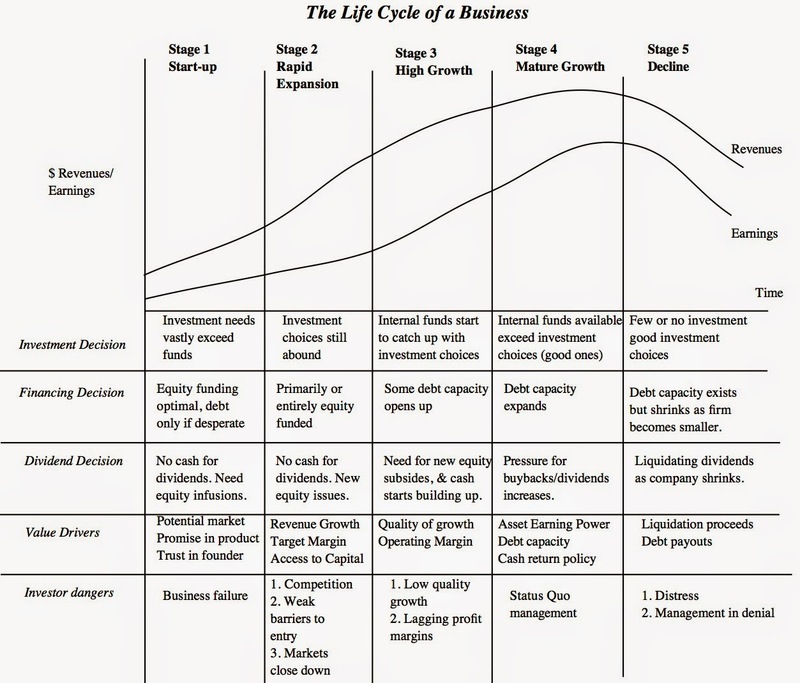 In a series of posts, I looked at the challenges of managing and investing in companies across the life cycle, including a few in the most depressing phase, which is during decline. I also conceded that there are examples of rebirth and reincarnation, where companies find a way back from decline (IBM in 1992 and Apple in 1999). In most cases, though, companies in decline that try to spend their way back to maturity have little to show in terms of earnings and growth for the billions of dollars spent on investments, acquisitions and R&D. Broken Business Model: The company's business model is dead, with the causes varying from company to company: management ineptitude, superb competition, macroeconomic shocks or just plain bad luck. Whatever the reasons, there is little hope of a turnaround and even less of a comeback. The manifestations are there for all to see: sharply shrinking revenues, declining margins and repeated failures at new business ventures/products/investments. Management in Denial: The managers of the company, though, act as if they can turn the ship around, throwing good money after bad, introducing new products and services and claiming to have found the fountain of youth. In some cases, the company may change managers at frequent intervals during the death spiral, but they all share in the denial. Enabling Ecosystem: The managers are aided and enabled by consultants (who collect fees from selling their rejuvenating tonics), bankers (who make money off desperation ploys) and journalists (either out of ignorance or because there is nothing better to write about than a company thrashing around for a solution). Resources to waste: While almost all declining companies share the three characteristics listed above, the walking dead companies are set apart by the fact that they have access to the resources to continue on their path to nowhere and have to be kept alive for legal, regulatory or tax reasons. Those resources can take the form of cash on hand, lifelines from governments and/or capital markets that have taken leave of their senses. The challenges that you face as an investor in a walking dead company is that you cannot assess its value, based upon the assumption that the managers in the company will take rational actions: make good investments, finance them with the right mix of debt and equity and return unneeded cash to stockholders. To get realistic assessments of value, you have to assume that managers will sometimes take perverse actions, investing in low-probability, high-possible-payoff investments (think lottery tickets), financing them with odd mixes of debt and equity (if you are on the road to nowhere, you don't particularly care about who you take down with you) and holding back cash from stockholders. Incorporating these actions into your valuation will yield lower values for these companies, with the extent of the discount depending upon the separation of management from ownership (it is easier to be destructive with other people's money), the capacity of managers to destroy value (which will depend on the cash/capital that they have access to and will increase with the size of the company) and the checks put on managers (by covenants, restrictions and activist investors). At the limit, managers without any checks, given enough time, on their destructive impulses can destroy all of a company's value, if not immediately, at least over time. For value investors, these companies are often value traps, looking cheap on almost every value investing measure but never delivering the promised returns, as managers undercut their plans at every step. In fact, I argued in a post in December 2011 that Blackberry (then called Research in Motion) needed to act its age, accept that it would never be a serious mass-market competitor in the smart phone market and settle for being a niche player. That post, which occurred when Blackberry had a market capitalization of $7.3 billion, argued that Blackberry should give up on introducing new tablets or phones and revert to a single model (which I termed the Blackberry Boring) catering to paranoid corporates (who do not want their employees accessing Facebook or playing games on smart phones). I also suggested that Blackberry settle on a five-year liquidation plan to return cash to stockholders. I was accused of being morbid and overly pessimistic, but here we are three years later, with Blackberry’s market cap at $5.3 billion. In the three years since my last post, the company has spent $4.3 billion in R&D, while its annual revenues have dropped from $18.4 billion in 2011-12 to $4.1 billion in the last twelve months and its operating income of $1.85 billion in 2011-12 has become an operating loss of -2.7 billion in the trailing twelve months. Blackberry’s new model may be a technological marvel, but the smart phone market has moved on, where a phone is only as powerful as the ecosystem of apps and other accessories available for it is. If it was true three years ago that Blackberry could not compete against Apple and Google in the operating system world, it is even truer today, when either of these mammoth companies can use petty cash to buy Blackberry. (Apple’s cash balance is $163 billion, Google’s cash balance is $63 billion and Blackberry’s enterprise value is $4.1 billion). Perhaps, I am missing something here, but I really don't see any light in the smartphone tunnel for Blackberry and even if I do, it is the headlight of an oncoming locomotive. The options for Blackberry, in my view, are even fewer than they were three years ago. At this stage, I am not sure that even the niche market option is viable any more. I see only two ways to encash whatever value is left in the company. The first is to hope that a strategic buyer (which to me is a synonym for someone who will pay far more than justified by the cash flows) with deep pockets will see some value in the Blackberry technology and buy the company. The second is a more radical idea. In a world where social media companies like Facebook, Twitter and Linkedin command immense value, with each user generating about $100 in incremental market cap, Blackberry should consider relabeling itself as a social media company, create a Blackberry Club, where those with Blackberry thumbs can stay connected. Outlandish, I know, but why not? Note that these numbers reflect my estimates of intrinsic value, which generated $146 billion for Alibaba's equity. I then revalued it on a relative basis at $39.19, but this valuation reflected a pricing of Alibaba at $118 billion. Allowing for both the higher cash balance and the re-estimated intrinsic values for the three businesses, my estimate of intrinsic value of $46.44 per share for Yahoo is higher than the current price of $40.66. If you don't trust my intrinsic value estimates, here is a simpler and far more powerful picture of where Yahoo stands today. 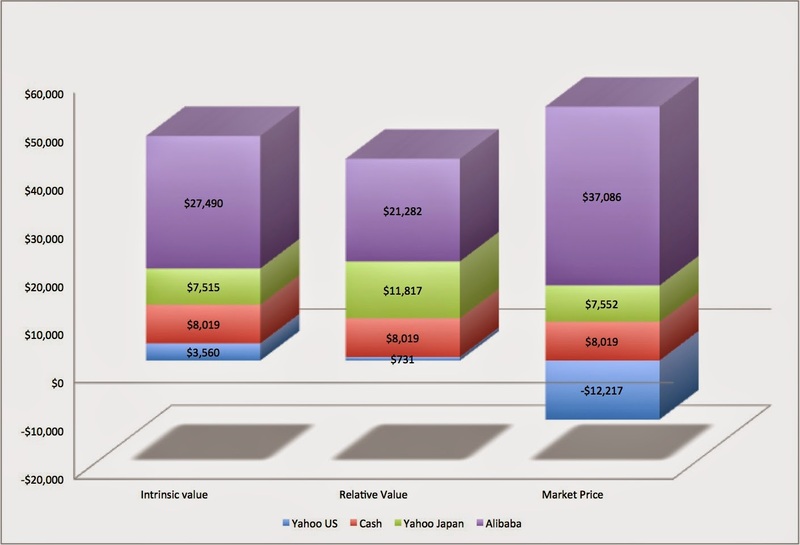 Using today's market prices for Yahoo's holdings in Alibaba and Yahoo! Japan and adding the net cash balance that Yahoo has, net of taxes due on the shares sold on the IPO date, the value per share is $52.14. At its current price, the market is attaching a value of -$12.22 billion (-$11.48/share) for the operating assets in Yahoo US. It is tough to imagine that this is a market oversight, since the market values of Yahoo Japan and Alibaba are easily checked and the cash balance is not really subject to debate. I am more inclined to view this as a Walking Dead discount, reflecting investor concerns, merited on not, that Yahoo's management might do something senseless with the cash, and incorporating the reality that liquidation is not a viable or a sensible option today. Why? Liquidating Yahoo's holdings today will require cashing out of the Yahoo Japan and Alibaba holdings today, resulting in a total tax bill of $16.3 billion and a value for the equity per share of $34.18. As an investor in Yahoo, the question I face is whether the discount that the market is applying to Yahoo is reasonable. While I believe that Marissa Mayer can do serious damage to me as investor, by embarking on ambitious expansion plans with the cash, I also believe that she will be checked by activist investors along the way. I will continue to hold Yahoo, at least at its current price, and hope for the best. That, to me, would require that Ms. Mayer recognize that Yahoo is really a shell company with two very valuable holdings and very little in actual or potential operating value. Perhaps, she would consider returning all cash to stockholders, reducing the workforce in the company to one person and giving that person a dual-display terminal and let him/her just watch the market value of Alibaba on one and Yahoo Japan on the other. That is my best case scenario and it is unfortunate, but true, that my value per share will move inversely with Ms. Mayer's ambitions. Stock Buybacks: They are big, they are back and they scare some people! This has been a big year for stock buybacks, continuing a return to a trend that started more than two decades ago and was broken only briefly by the crisis in 2008. Focusing just on the S&P 500 companies, buybacks in the 2013 amounted to $475.6 billion, not quite as substantial as the best buyback year in history (2007, with $589.1 billion), but still significantly up since 2009. As stock prices rise and anxiety about bubbles and real economic growth also come to the surface, it is not surprising that some of those looking at rising prices are trying to make a connection, rightly or wrongly, to the buyout numbers. As a general rule, even insightful stories about buybacks tend to focus on one cause or effect of the buyback phenomenon but miss the big picture. In particular, there have two news stories about buybacks, one in the Economist and one in the Wall Street Journal. Since I talked to both journalists as they wrote these stories, and I am quoted in one of them, I should disclose that I like both writers and think they did their research, but their particular perspectives (that stock buybacks can be value destructive in the Economist and that they affect liquidity in the WSJ) may be blurring the big picture of buybacks. In fact, I think that the Economist overplayed their hand by calling buybacks “corporate cocaine”, a loaded header that treats buybacks as a destructive addiction (for which the cure, as with any other addiction, is abstinence). This post is not aimed at the vast majority of investors who sensibly view buybacks as good or bad on a company-by-company basis but at the shameless boosters of buybacks, who treat it as a magic bullet, at one extreme, and the equally clueless Cassandra chorus, who view it as the market equivalent of the Ebola virus, signaling the end of Western civilization as we know it, at the other. For much of the last century, companies were not allowed to buy back stock, except in exceptional circumstances. 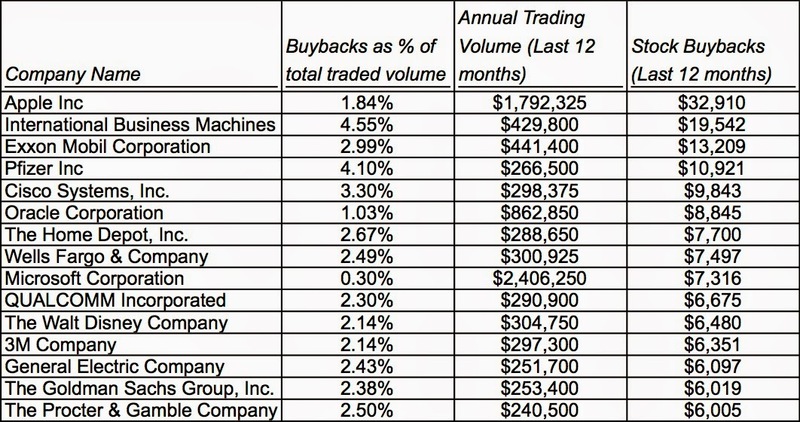 In the United States, companies have been allowed to buy back stock for most of their existence, but the pace of buybacks did not really start picking up until the early 1980s, which some attribute to a SEC rule (10b-18) passed in 1982, providing safe harbor (protection from certain lawsuits) for companies doing repurchases. The legal rules governing buybacks in the US today are captured nicely in this Harvard Law School summary. 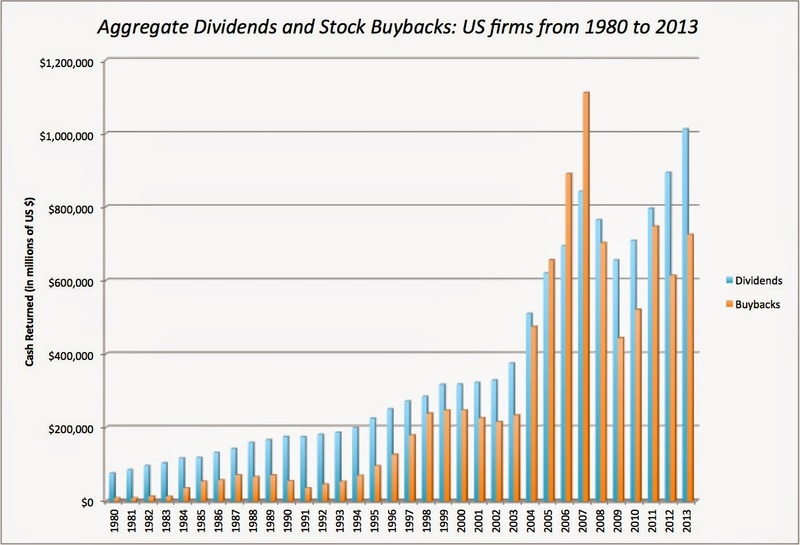 In the graph below, I show aggregate stock buybacks and dividends at US companies going back to 1980. 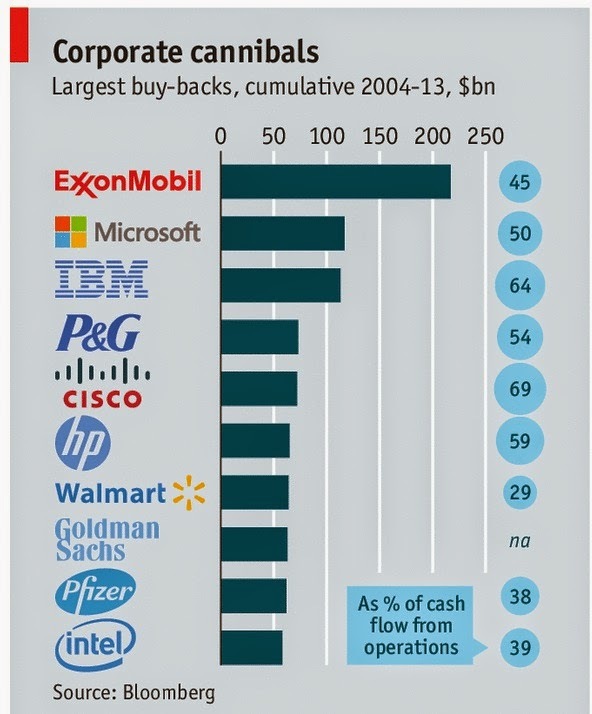 This graph backs up the oft-told story of the shift to buybacks occurring at US companies. While dividends represented the preponderance of cash returned to investors in the early 1980s, the move towards buybacks is clear in the 1990s, and the aggregate amount in buybacks has exceeded the aggregate dividends paid over the last ten years. In 2007, the aggregate amount in buybacks was 32% higher than the dividends paid in that year. The market crisis of 2008 did result in a sharp pullback in buybacks in 2009, and while dividends also fell, they did not fall by as much. While some analysts considered this the end of the buyback era, companies clearly are showing them otherwise, as they return with a vengeance to buy backs. As some of those who have commented on my use of the total cash yield (where I add buybacks to dividends) in my equity risk premium posts have noted (with a special thank you to Michael Green of Ice Farm Capital, who has been gently persistent on this issue), the jump in cash returned may be exaggerated in this graph, because we are not netting out stock issues made by US companies in each year. This is a reasonable point, and I have brought in the stock issuances each year, to compute a net cash return each year (dividends + buybacks - stock issues) to contrast with the gross cash return (dividends + buybacks). Note that I have converted all these numbers into yields, by dividing them by the aggregate market capitalization at the end of each year. Both the gross cash yield (5.53%) and net cash yield (3.89%) peaked in 2007, and the lowest values for these numbers were in 1999 and 2000, when the gross cash yield was 2.17% (1999) and the net cash yield was 0.67% (2000). At the end of 2013, the gross cash yield stood at 4.49% and the net cash yield at 3.16%, both slightly higher than the aggregate values of 4.24% for the gross yield and 2.46% for the net yield over the 1980-2013 time periods; the simple averages yield 4.65% for the gross yield and 2.60% for the net yield over the entire time period. Other than utilities, the shift to dividends is clear in every other sector, with technology companies leading with almost 76% of cash returned taking the form of buybacks. To understand buybacks, it is best to start simple. Publicly traded companies that generate excess cash often want to return that cash to stockholders and stockholders want them to do that. There are only two ways you can return cash to stockholders. One is to pay dividends, either regularly every period (quarter, semiannual or year) or as special dividends. The other is to buy back stock. From the company’s perspective, the aggregate effect is exactly the same, as cash leaves the company and goes to stockholders. There are four differences, though, between the two modes of returning cash. Dividends are sticky, buybacks are not: With regular dividends, there is a tradition of maintaining or increasing dividends, a phenomenon referred to as sticky dividends. Thus, if you initiate or increase dividends, you are expected to continue to pay those dividends over time or face a market backlash. Stock buybacks don’t carry this legacy and companies can go from buying back billions of dollars worth of stock in one year to not buying back stock the next, without facing the same market reaction. Buybacks affect share count, dividends do not: When a company pays dividends, the share count is unaffected, but when it buys back shares, the share count decreases by the number of shares bought back. Consequently, share buybacks do alter the ownership structure of the firm, leaving those who do not sell their shares back with a larger share in a smaller company. Dividends return cash to all stockholders, buybacks only to the self-selected: When companies pay dividends, all stockholders get paid those dividends, whether they need or want the cash. Thus, it is a return of cash that all stockholders partake in, in proportion to their stockholding. In a stock buyback, only those stockholders who tender their shares back to the company get cash and the remaining stockholders get a larger proportional stake in the remaining firm. As we will see in the next section, this creates the possibility of wealth transfers from one group to the other, depending on the price paid on the buyback. Dividends and buybacks create different tax consequences: The tax laws may treat dividends and capital gains differently at the investor level. Since dividends are paid out to all stockholders, it will be treated as income in the year in which it is paid out and taxed accordingly; for instance, the US tax code treated it as ordinary income for much of the last century and it has been taxed at a dividend tax rate since 2003. A stock buyback has more subtle tax effects, since investors who tender their shares back in the buyback generally have to pay capital gains taxes on the transaction, but only if the buyback price exceeds the price they paid to acquire the shares. If the remaining shares go up in price, stockholders who do not tender their shares can defer their capital gains taxes until they do sell the shares. Buybacks can have no effect, a positive effect or negative effect on equity value per share, depending on where the cash from the buyback is coming from and how it affects the firm’s investment decisions. To illustrate the effects, let’s start with a simple financial balance sheet (not an accounting one), where we estimate the intrinsic values of operating assets and equity and illustrate the effects of a stock buyback on the balance sheet. Note that the buyback can be funded entirely with cash, partly with cash and partly with new debt or even entirely with debt. (I am going to leave out the perverse but not uncommon scenario of a company that funds a buyback with a new stock issue, since the only party that is enriched by that transaction is the investment banker who manages both the issuance and the buyback). 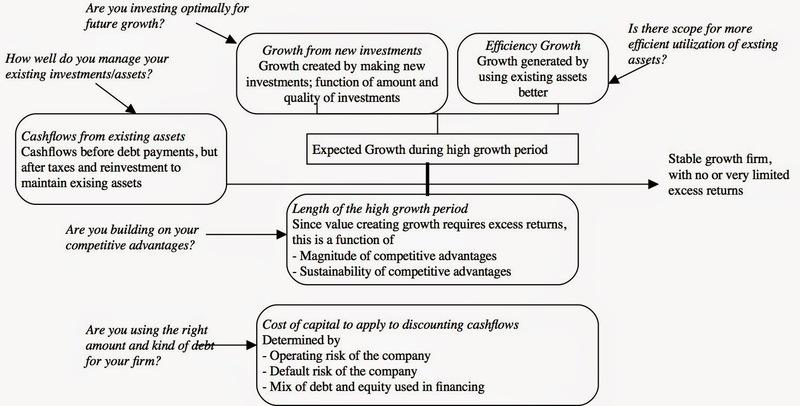 The value of the operating assets can change, if the net debt ratio of the company changes after the buyback (thus affecting the cost of capital) or if the buyback reduces the amount that the company was planning to invest in its operating assets (thus changing the cash flows, growth and risk in these assets). This framework is a useful vehicle to look at the conditions under which buybacks have no effect on value, a positive one and a negative one. The indifferent: For buybacks to have no effect on value, they should have no effect on the value of the operating assets. 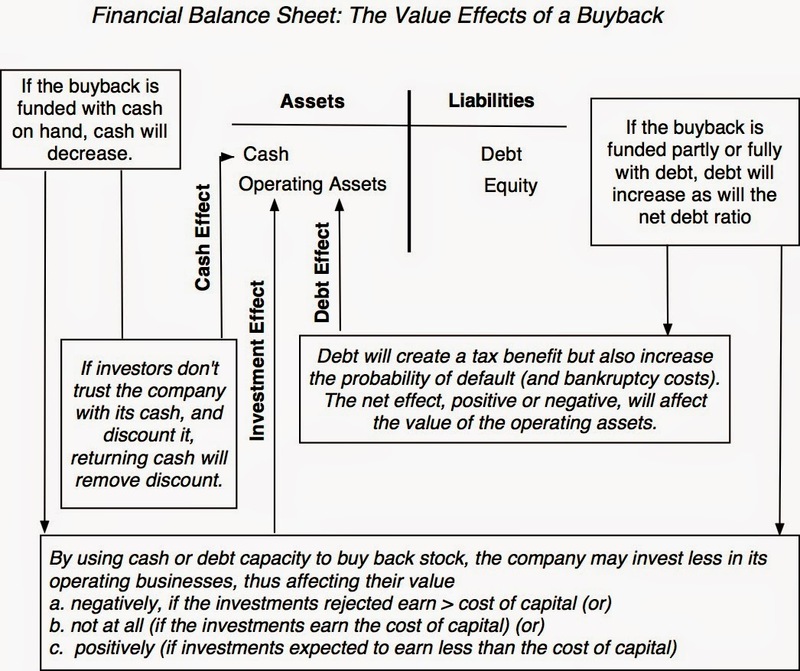 That must effectively mean that the buyback is entirely funded with cash off the balance sheet or that even if funded with debt, there is no net value effect (tax benefits cancel out with default cost) and that the buyback has no effect on how much the company invests back into its operating assets. As an example, consider the $13.2 billion in stock buybacks at Exxon Mobil in 2013. The company funded the buybacks entirely with cash surpluses and it not only had more than enough cash to cover reinvestment needs but continues to generate billions of dollars in excess cash (over and above its reinvestment needs). Discounted cash holdings: There are some companies with significant cash balances, where investors do not trust the management of the company with their cash (given the track record of the company). Consequently, they discount the cash in the hands of the company, on the assumption that they will do something stupid, and this stupidity discount can be substantial. This is one of the few scenarios where a stock buyback, funded with cash, is an unalloyed plus for stockholders, since it eliminates the cash discount on the cash paid out to stockholders. Financial leverage effect: A firm that finances a buyback with debt, increasing its debt ratio, may end up with a lower cost of capital, if the tax benefits of debt are larger than the expected bankruptcy costs of that debt. That will occur only if the firm has debt capacity to begin with, but that lower cost of capital adds to the value of the operating assets, though it can be argued that it is less value enhancement and more of a value transfer (from taxpayers to stockholders). The bad: There are two ways in which a buyback can have a negative effect on value. The first is if the firm is correctly or over levered and chooses to finance the buyback with even more debt, since that would push the cost of capital higher after the buyback (as the expected bankruptcy costs overwhelm the tax benefits of debt). The second is if the firm takes cash that would have been directed to superior investment opportunities (where the return on capital > cost of capital) and uses it to buy back stock; this requires that the company also face a capital constraint, imposed either internally (because the company does not like to raise new financing) or externally (because the company is prevented from raising new financing). 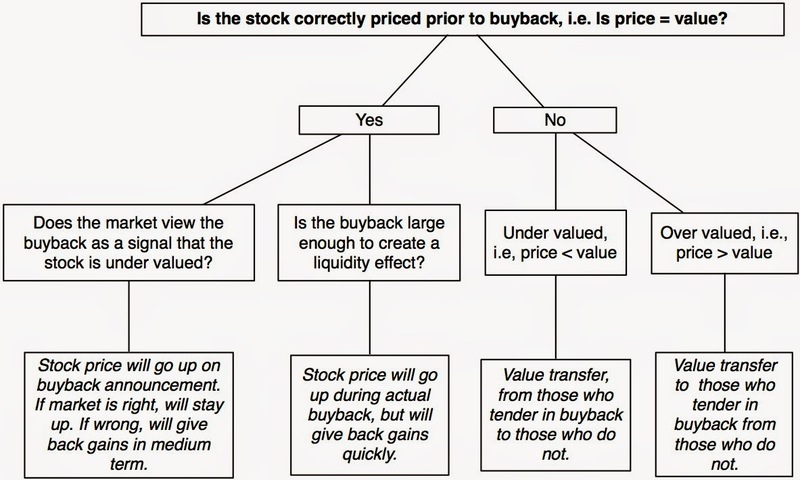 Market mispricing: If the stock is mispriced before the buyback, the buyback can create a value transfer between those who tender their shares back in the buyback and those who remain as stockholders, with the direction of the transfer depending on whether the shares were over or under valued to begin with. If the price is less than the value, i.e., the stock is under priced, a buyback at the prevailing price will benefit the remaining shareholders, by letting them capture the difference but at the expense of the stockholders who chose to sell their shares back at the “low price”. In fact, it is likely that the market will view the announcement of the buyback as a signal that the stock is under valued and push the price impact in what is commonly categorized as a signaling effect. If the price is greater than the value, i.e., the stock is over priced, a buyback will benefit those who sell their shares back, again at the expense of those who hold on to their shares. In either case, there is no value creation but only a value transfer, from one group of stockholders in the company to another. Lest you feel qualms of sympathy for the losing group in either scenario, remember that most stockholders get a choice (to tender or hold on to the shares) and if they make the wrong choice, they have to live with the consequences. Signaling: For better or worse, markets read messages into actions and then translate them into price effects. Thus, when companies buy back stock, investors may consider this to be a signal that these companies view their stock to be under valued. If there is a signaling effect, you should expect to see the stock price jump on the announcement of the buyback and not the actual execution. The problem with this signaling story is that it attributes information and valuation skills to the management of the company that is buying back stock, that they do not possess. The evidence on whether companies time stock buybacks well, i.e., buy back their stock when it is cheap, is weak. While there is some evidence that companies that buy back their own stock outperform the market in the months after the buyback, there is also evidence that buybacks peak when markets are booming and lag in bear markets. In summary, buybacks can increase value, if they lower the cost of capital and create a tax benefit that exceeds expected bankruptcy costs, and can increase stock prices for non-tendering stockholders, if the stock is under valued. Buybacks can destroy value if they put a company’s survival at risk, by either eliminating a cash buffer or pushing debt to dangerously high levels. They can also result in wealth transfer to the stockholders who sell back over those who remain in the firm, if the buyback price exceeds the value per share. What about the share count effect? This is the red herring of buyback analysis, a number that looks profoundly meaningful at first sight but is useless in assessing the effect of a buyback, on deeper analysis. Let’s start with the obvious. A stock buyback will always reduce share count. For those lazy enough to believe that dilution is the bogeyman, and that less shares is always better than more, buybacks are always good news. However, lower share count often does not signify higher value per share and it may not even signify higher earnings per share (or whatever per share metric you use). For those slightly less lazy, focused on earnings per share, the assessment of whether a buyback is good news boils down to estimating how much earnings per share goes up after it happens. In a world where PE ratios stay constant, come out of sector averages, or are just made up, this will translate into higher price per share. The problem is that a buyback alters the risk profile of a firm and should also change its PE ratio (usually to a lower number). To assess the effect of a buyback, you have to consider the full picture. You have to look at how it is financed (and the effect it has on debt ratio and cost of capital) and how the stock price relates to its fair value (under priced, correctly priced or over priced) to make a judgment on whether stockholders will benefit or be hurt by the stock buyback. I have a simple spreadsheet that tries to do this assessment that you are welcome to take for a spin. 1. The leverage story: The notion that US companies are dangerously over levered seems to be built on two arguments: the aggregate debt levels of businesses as reported in the US national accounts and on anecdotal evidence (Apple borrowed money to do buybacks, so every one must...). 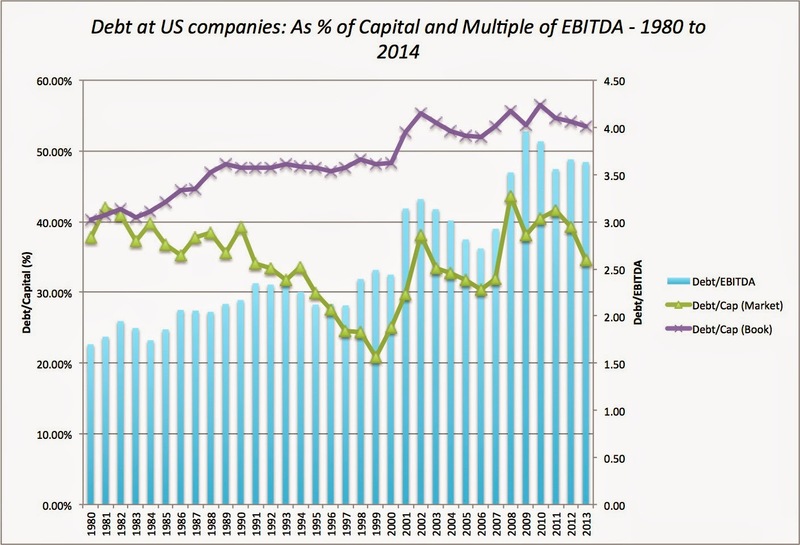 To examine this argument, I have estimated debt levels at US companies from 1980 to 2013 in the graph below, both as a percentage of capital (book and market) and as a multiple of EBITDA. It is true that overall financial leverage, at least as measured relative to book value and EBITDA has increased over time (though it has remained relatively stable, as a percent of market value). While this increase can be partially explained by decreasing interest rates over the period, it is worth asking whether buybacks were the driving force in the increased leverage. To answer this question, I compared the debt ratios of companies that bought back stock in 2013 to those that did not and there is nothing in the data that suggests that companies that do buybacks are funding them disproportionately with debt or becoming dangerously over levered. Companies that buy back stock had debt ratios that were roughly similar to those that don't buy back stock and much less debt, scaled to cash flows (EBITDA), and these debt ratios/multiples were computed after the buybacks. The trend line (on everything other than cap ex as a percent of sales) does back the conventional wisdom, and since buybacks went up over the same period, the bad news bears seem to win this round, right? Well, not so fast! What if investment opportunities in the US, in sectors other than technology, are drying up, either because of global competition or due to industry maturation? If this is the case, not only should you expect exactly what you observe in the data (less reinvestment, more cash returned) but it is a good thing, not a bad one. Before you get too heated under the collar, there are three things to remember in this debate. The first is that there is little evidence that companies that buy back stock reduce their capital expenditures as a consequence. 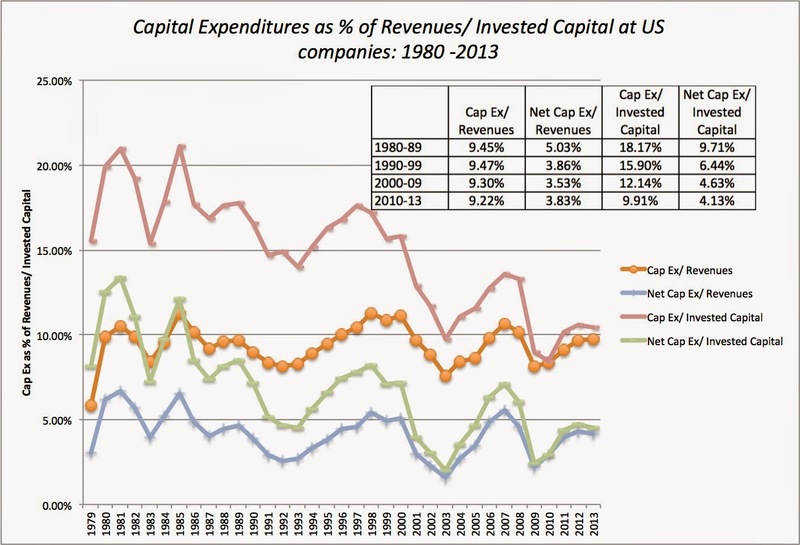 The table reports on the capital expenditures and net capital expenditures, as a percent of enterprise value and invested capital, at companies that buy back stock and contrasts them with those that do not, and finds that at least in 2013, companies that bought back stock had more capital expenditures, as a percent of invested capital and enterprise value. When you net depreciation from capital expenditures (net cap ex), the two groups reinvested similar amounts, as a percent of enterprise value), but the buyback group reinvested more as a percent of invested capital. 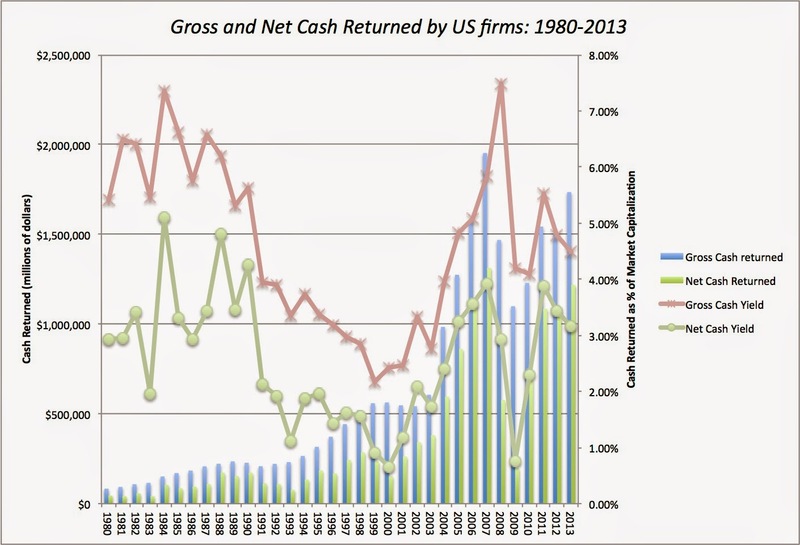 The second is that the cash that is paid out in buybacks does not disappear from the economy. It is true that some of it is used on conspicuous consumption, but that is good for the for the economy in the short term, and a great deal of it is redirected elsewhere in the market. In other words, much of the cash paid out by Exxon Mobil, Cisco and 3M was reinvested back into Tesla, Facebook and Netflix, a testimonial to the creative destruction that characterizes a healthy, capitalist economy. As a stockholder in any of these companies, can you honestly tell me that you would rather have had these companies reinvest back in their own businesses? Put differently, how many of you wish that Microsoft had not bought back $100 billion worth of shares over the last decade and instead pumped that money into more Zunes and Surfaces? Or that Hewlett Packard instead of paying out $60 billion to stockholders had bought three more companies like Autonomy (and written them off soon after)? Or that Cisco had spent the $70 billion in buyback money on a hundred small acquisitions? If, as the Economist labels them, these companies are cannibals for buying back their own stock, investors in these companies wish they had more voracious appetites and eaten themselves faster. There are two other issues brought up by critics of stock buybacks. One is that there is firms may buy back stock ahead of positive information announcements, and those investors who tender their shares in the buy back will lose out to those who do not. The other is that there is a tie to management compensation, where managers who are compensated with options may find it in their best interests to buy back stock rather than pay dividends; the former pushes up stock prices while the latter lowers them. Note that doing a buyback ahead of material information releases is already illegal, and any firm that does it is already breaking the law. As for management compensation, I agree that there is a problem, but buybacks are again a symptom, not a cause of the problem. In my view, it is poor corporate governance practice on the part of boards of directors to grant huge option packages to managers and then vote for buybacks designed to make managers even better off. Again, fixing buybacks does nothing to solve the underlying problem. I think that both ends of the spectrum on buybacks are making too much of a simple cash-return phenomenon. To the boosters of buybacks as value creators, it is time for a reality check. Barring the one scenario where companies that buy back stock stop making value-destructive investments, almost every other positive story about buybacks is one about value transfers: from taxpayers to equity investors (when debt is used by an under levered firm to finance buybacks) and from one set of stockholders to another (when a company buys back under valued stock). To those who argue that buybacks are destroying the US economy, I would suggest that you are using them as a vehicle for real concerns you have about the evolution of the US economy. Thus, if you are worried about insider trading, executive compensation, tax-motivated transactions and or under investment by the manufacturing sector, your fears may be well placed, but buybacks did not cause of these problems, and banning or regulating buybacks fall squarely in the feel-good but do-bad economic policy realm. Is it possible that some companies that should not be buying back stock are doing so and potentially hurting investors? Of course! As someone who believes that corporate finance at many companies is governed by inertia (we buy back stock because that is what we have always done...) and me-too-ism (we buy back stock because every one else is doing it...), I agree that there are value destroying buybacks, but I also believe that collectively, buybacks make far more sense than dividends as a way of returning cash to equities. In the Economist article, I am quoted as saying that dividends are a throwback to the nineteenth century (not the twentieth), when stocks were offered as investment choices to investors who were more used to bonds and that fixed, regular dividends were designed to imitate coupons. Since equity is a residual claim, it is not only inconsistent to offer a fixed cash flow claim to its owners, but can lead (and has led) to unhealthy consequences for firms. In fact, I think firms are far more likely to become over levered and cut back on reinvestment, with regular dividends that they cannot afford to pay out, than with stock buybacks. In my last post on Alibaba, I valued the company at about $162 billion but also argued that investors considering investing in the company might hold back because of corporate governance concerns. I will start by making the case (and it is an easy one) that Alibaba is more corporate dictatorship than corporate democracy, but I would then like to use the company as a vehicle to talk about what constitutes good corporate governance and how best to incorporate its presence or absence into value. Legal Structure: The corporate governance problem with Alibaba starts with its legal structure. As I have noted in my prior posts, if you buy shares in Alibaba, you are not getting a piece of Alibaba, the Chinese online merchandising profit-machine, but a portion of Alibaba, the Cayman-Islands shell entity that has a contractual arrangement to operate its Chinese counterpart. While the Chinese government has granted legal standing to that contractual agreement, at least for the moment, it reserves the right to change it's mind and if it does, Alibaba's shareholders will be left with just the shell. Management Powers: While the board of directors in publicly traded companies often fail in their obligation to protect the interests of stockholders, stockholders at least get to elect board members and have a say (nominal thought it may be) in the management of the company. With its partnership set-up, Alibaba has stripped even this minimal power away from stockholders, and the board will be named by a group of partners, which includes Jack Ma and his hand-picked partners. This is decision by corporate politburo, not through corporate democracy, but to give the Hong Kong Stock Exchange credit, they refused to allow Alibaba a listing with this set-up, but the NASDAQ NYSE seemed to have no qualms. In fact, given the NASDAQ’s NYSE's track record of going after large market cap listings at any cost, is there is any entity (Atilla the Hun? The Evil Empire? ), with sufficient market capitalization, that the NASDAQ NYSE would refuse to list? (In my initial version of this post, I had wrongly accused the NASDAQ for this listing sin and I apologize, since I am sure that the NASDAQ would never have been this craven). Country setting: China has been the growth story of the decade and there is much to admire in the country’s single minded focus at making itself a first world economy. However, it is not a market economy in any sense of the word and I do not believe that the management at a Chinese company, let alone one as large and high-profile as Alibaba, can survive, if it upsets the Beijing power structure. Thus, it not only does not surprise me to read stories like this one about ties with politics but it brings home the realization that what stockholders want for this company is irrelevant, if their wants are not consistent with what the Chinese government would like to see happen. In effect, you have a corporate non-governance trifecta, a publicly traded entity with questionable legal standing, run by a strong willed CEO who can write his own rules, in a country that does not put much weight on ownership rights. To give Alibaba credit, they do not hide the fact that this is a company where stockholders are powerless, as evidenced by this section from the prospectus (Pages 57-60), where they are clear that they are not required to maintain the illusion of board independence and accountability that most public corporations are required to. Now that we have established that stockholders in Alibaba have no power, it is time to ask a broader question about what exactly constitutes good corporate governance. In the last three decades, academic research and shareholder services have followed a standard path to measuring corporate governance by looking at the corporate charter and the composition of the board of directors. Institutional Shareholder Services (ISS), which provides perhaps the most widely used measure of corporate governance, builds its quick score around four pillars: an audit pillar (looking at whether the company makes its financial filings in time), a board pillar (director composition, compensation and shareholder approval rates), a shareholder rights pillar (hostile takeover restrictions, ease of dilution) and a compensation pillar (whether it is aligned with performance, how much say stockholders have in setting it and how well it is disclosed). Through no fault of ISS, companies have learned the system and play it well, meeting the checklist criteria for good corporate governance while rendering the concept toothless. While I understand the need to use objective measures to arrive at corporate governance scores, my definition of corporate governance is both broader and more difficult to measure. It reflects the power of stockholders to change the management of a company, if they feel the urge to do so. In that sense, it is very similar to the power that voters have in a democracy, to change their government. Note that the right to change management (or a government) may not always be exercised, because stockholders (voters) are lazy and abstain, or be exercised wisely, insofar as stockholders (voters) may leave bad managers (governments) in place or replace good managers (governments). The key is that with they have the power to create change, if they choose to. Proponents of stronger corporate governance argue that it critical to corporate performance, but the evidence of the link between the two is not very strong. There are badly run companies with impeccable corporate governance in place and superbly performing businesses where there is absolutely no restraint on corporate managers. Google and Facebook are corporate fiefdoms, where founder/CEOs have unchallenged power to do almost anything that they want, but they are also companies that have delivered immense profits and value to their stockholders. It is true that generalizing on the basis of anecdotal evidence is dangerous, but studies that look at the overall relationship between measures of strong corporate governance and value deliver the same fuzzy message that good corporate governance does not always translate into higher value or better performance. One of the most widely quoted studies in support of strong corporate governance is this one, which finds that companies with stronger stockholder rights have higher profits and trade at higher multiples than companies with weak governance. Other studies, though, note that the the correlation between corporate governance measures and stock performance is weak and that there is some evidence that subsets of firms with weak corporate governance deliver superior performance. As in the previous section, you can use an analogy from political governance to examine the link of governance with performance. Is a country better off run by a benevolent (and intelligent) ruler-for-life or by a sometimes chaotic, often messy democracy? As someone whose instincts tend towards the latter, I would love to tell you that the answer is obvious, but I have had my moments of frustration with self-serving, short-term legislation and populist politicians, when I have dreamed about the former. At the start of each of my valuation classes/sessions, I start with what I call the It Proposition and here is how it goes, “If it does not affect the cash flows or the risk in an investment, it cannot affect value”. If you are wondering what “it” is, “it” can be any of those words that are used to justify adjusting value with premiums (control, synergy, brand name) or discounts (illiquidity). Since it would be hypocritical of me to abandon this proposition in the context of corporate governance, I would argue that any corporate governance effect on value has to show up in either the cash flows or the risk. To consider how best to incorporate good or bad corporate governance into the value of a company, consider the determinants of value. We make judgments about how well a company is managing its existing assets, how much value there will be in future growth and the risk in the business to arrive at an estimate in value. These judgments, though, are based upon assumptions about who is running the company (the management) and what these incumbent managers do well or badly. Thus, if you are valuing a company where managers have had a history of delivering high growth efficiently but are conservative when it comes to the use of debt, you may assume continued high quality growth accompanied by predominantly equity funding in valuing the company. In contrast, if you are valuing a company that borrows too much and consistently over pays on acquisitions, you may assume that those destructive tendencies will continue in valuing the company. Let’s term these the status quo values. Now, consider revaluing these companies with a new management in place without the blind spots of the status quo managers and reassess investment, financing and dividend policies. This will require you to take a fresh look at the key inputs into value, and with the changes that you make in how the company is run, you can revalue the company. Let’s term this value the optimal value. Note that the probability attached to the optimal value can be construed as the probability of management change and it gives us a platform for assessing the value of corporate governance. If corporate governance is weak or non-existent, the probability of changing management decreases and the expected value of a company will converge on the status quo value. That may not result in significant value loss, if you have a well managed company, but the discount for bad corporate governance can be significant for a poorly managed company. The static approach to valuing corporate governance tends to work better for mature companies that are set in their ways. It does not work as well for younger companies that are run by strong willed CEOs, but are also perceived as being run well (at least for the moment). In these companies, the status quo and the optimal values may converge, leading to the conclusion that corporate governance does not have an impact on value. Thus, if you were valuing Google or Facebook, companies with excellent track records and imperial CEOs, you may conclude that there is little consequence to having poor corporate governance. Taking a longer-term perspective, and borrowing again from the political governance framework, the advocates for strong corporate governance would argue that there is a cost to bad corporate governance even at companies that are well managed today, since you are buying a share of these companies in perpetuity. That cost will show up in the future, when managers make wrong choices (and even the best ones do) or take value destructive paths. Since they are not accountable to stockholders and boards tend to be rubber stamps, there is no mechanism for bringing them back on track and the costs in the long term can be immense to stockholders. Even with the longer term perspective, though, there are others who argue that the restraints put on top management in a strong corporate governance system will result in slower and sub-optimal decisions, perhaps costing investors value in future periods. Notice that while the expected value ($66.45/share & $162.9 billion in equity) and median value ($65.15/share & $159.7 billion in equity) are close to my base case valuation ($65.98/share & $161.7 billion in equity), there are outcomes that diverge widely from these numbers. Based on my assumptions, Alibaba could be worth as little as $38.11/share ($93.7 billion), if revenue growth drops, margins sag and risk rises, or as much as $153.10/share ($ 374.4 billion ). While this is going to be true for any firm with uncertainty about the future, the distribution of value allows us to get perspective on the contrasting points of view about strong management. The Benevolent Ruler school: Investors in this school see an upside to unrestrained managers, arguing that there will be opportunities that will open up for the company to increase its value that require the quick, decisive and consistent actions that a strong, informed CEO can make without having to worry about or being slowed down by stockholder reactions or board approval. 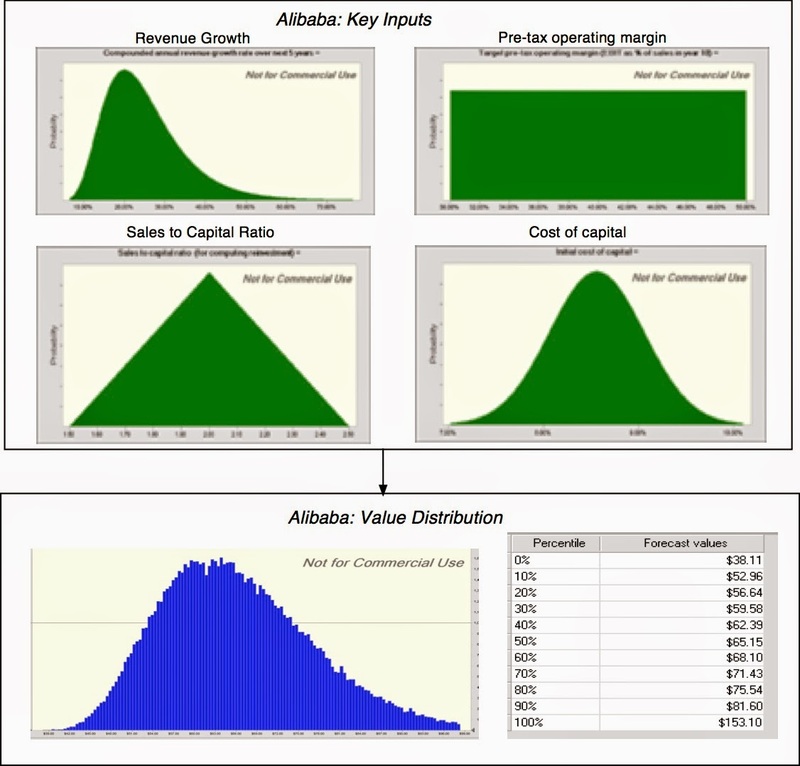 In effect, investors in this school may actually add a premium to discounted cash flow value to reflect the CEO's power, because they believe that a stronger CEO makes it more likely that Alibaba's value will converge on a higher number. The Corporate Democracy school: Investors in this school believe that CEOs with absolute power will inevitably make mistakes, and lacking accountability to shareholders and an active board of directors, will continue down value-destructive paths. Not surprisingly, these investors will reduce their DCF value to reflect this probability. The determinants of the premium attached by the first school and the discount tacked on by the second school are surprisingly similar. They will both increase as the uncertainty in the value of the business increases, since they have the characteristics of an option: a call option that adds value for the benevolent ruler school and a put option that reduces value with the corporate democracy school. They will also increase with your time horizon as an investor, with longer time horizons associated with higher values for both the premium and discount. Thus, if you are investor with a ten-year time horizon, you care a lot more about the good and bad qualities of top management than if have a six-month time horizon. That, in turn, may explain why so few portfolio managers and investors seem to be even looking at the corporate governance question with Alibaba with any concern. As a long term investor, I am torn. While I think that Alibaba's current management team has done an superb job in building up the company, my instincts as an investor and my memories of well-managed companies that have mutated into badly run ones (with the same CEO in place) make me hold back. To be honest, I don't like being asked for my money (as an investor) and then being told that I have no say in how its run. With Alibaba, the decision is easier for me, at least for the moment, because the company is, at best, fairly priced at its offering price. It will be a decision, though, that I will have to revisit, if the price drops and the value does not. In effect, I will have to decide the discount on value at which I am okay with being in Jack Ma's outhouse.